Regular physical exercise is, without a doubt, an effective method of getting ourselves healthy and physically fit. By physical exercise, it doesn’t entirely mean that we need to undergo strenuous exercise routines or go to the gym regularly; all we need to do is be physically active and to move more. 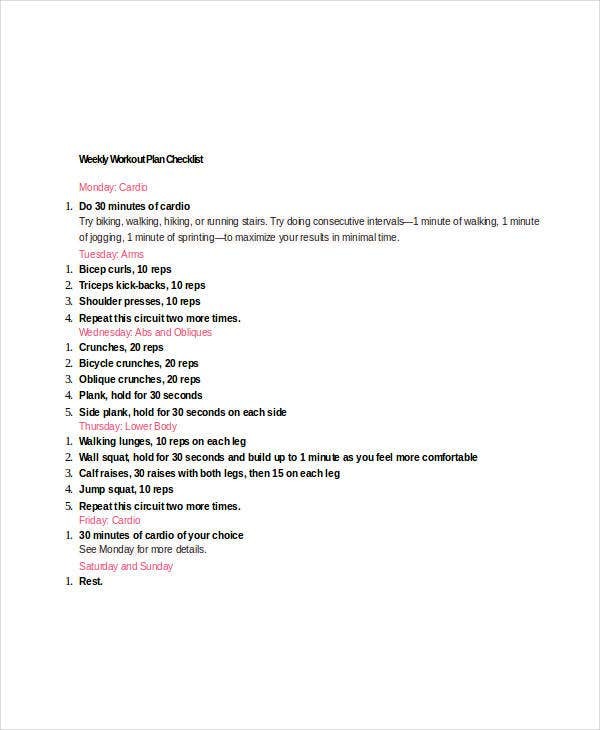 People may not have the budget to go to the gym or to get themselves a personal trainer, so all they can do is make their own workout routine. 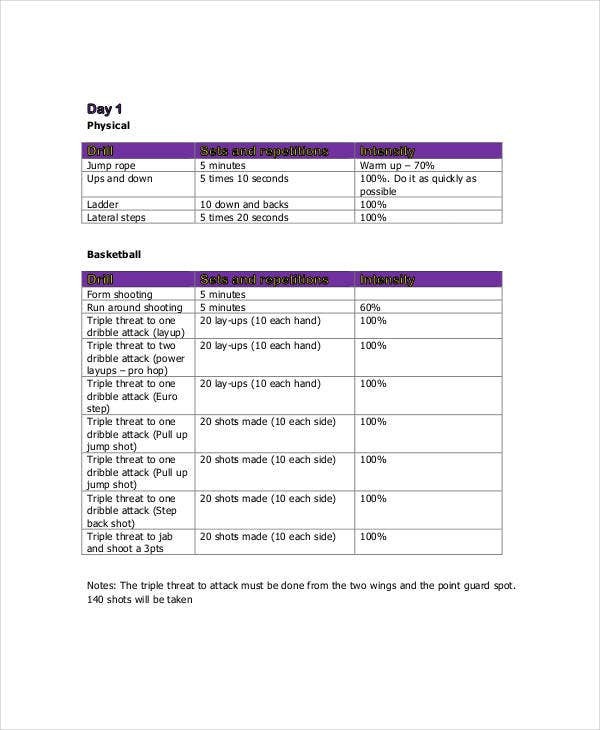 And one way to be able to remember what they did the last time and what to do on their next exercise session is by using a checklist. 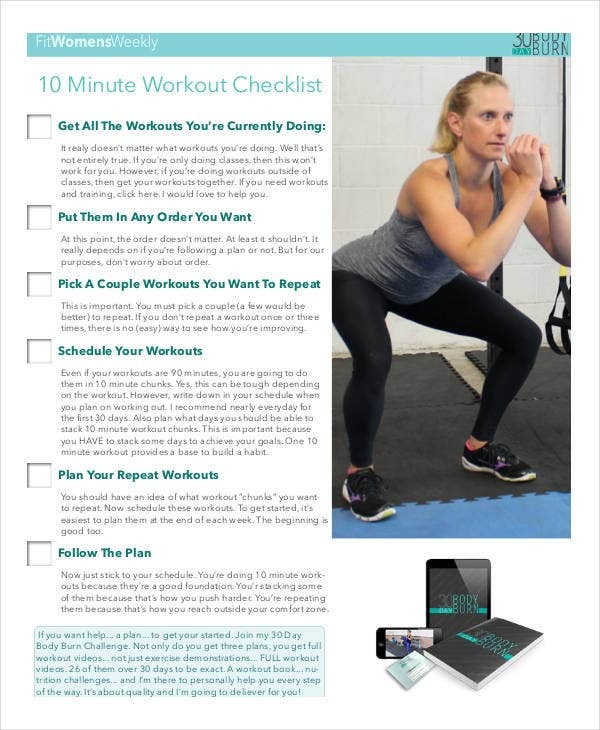 Read on to see our collection of editable workout checklist templates here on our website. 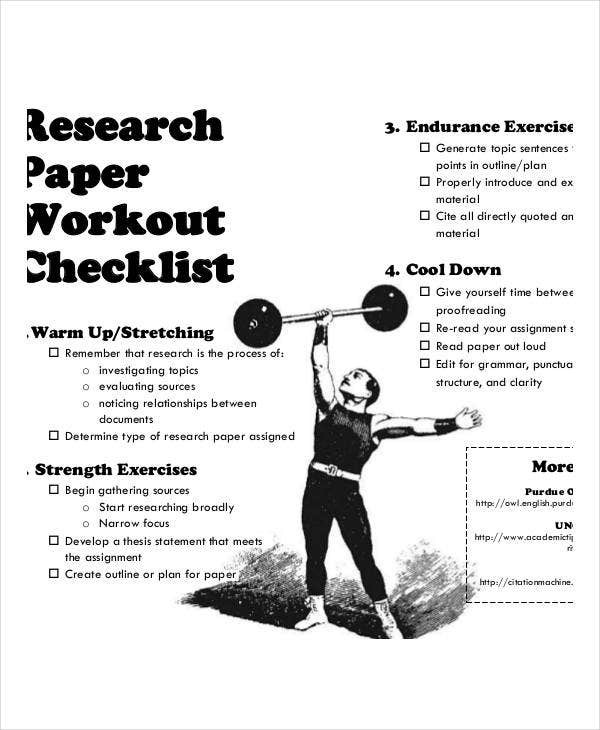 A checklist is a comprehensive list of things to do that may or may not be done in a specific order. Its use can help improve efficiency and productivity by minimizing errors and lapses. Checklists can help us remember the things that we need to do. Checklists can help us become more productive because we are already aware on what to do next as well as the number of pending tasks. We are more motivated when we have clear picture on the things that we need to do. Being productive and time efficient can help us reach our goals quickly and easily. 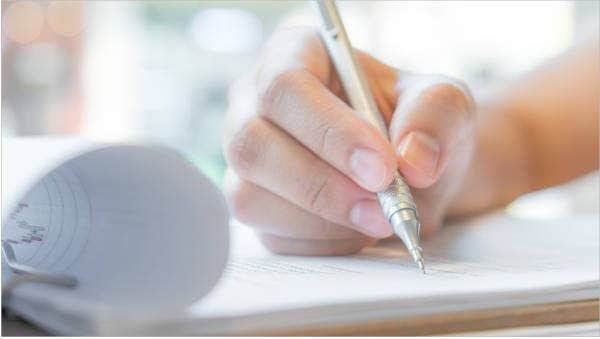 If you are looking for checklist templates to assist you on accomplishing multiple tasks at a given time, then check out our collection of Task Checklist Template. Prevention is always better than cure, and working out help reduce the risk of heart diseases naturally. Regular exercise can keep your muscles, joints, heart, and lungs active; therefore, it can help in increasing your energy levels. Since stretching and strength training is and integral part of working out, it helps in increasing your muscle strength and flexibility. Working out burns fats and calories, which can result in regulating or controlling your body weight. Regular physical exercises can add more years to your life. 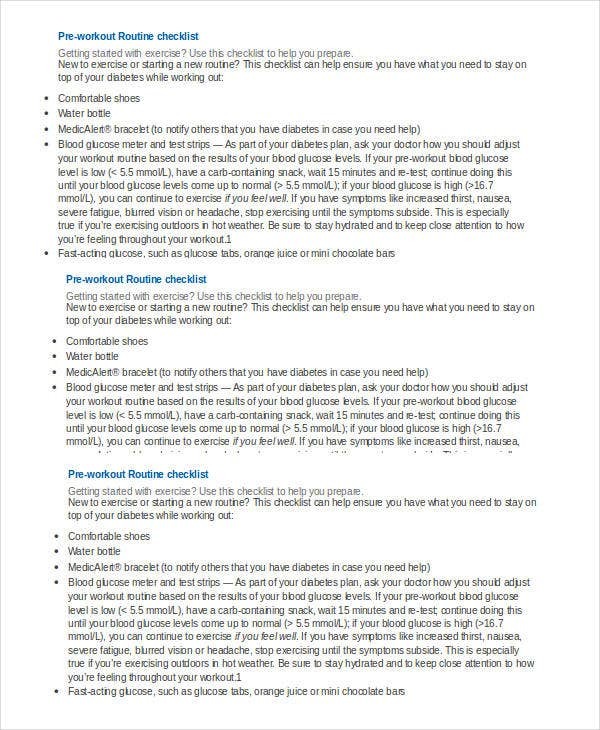 For a template collection exclusively in the Doc and Docx format, check out our collection of Word Checklist Template. Interested in getting fit and healthy already? 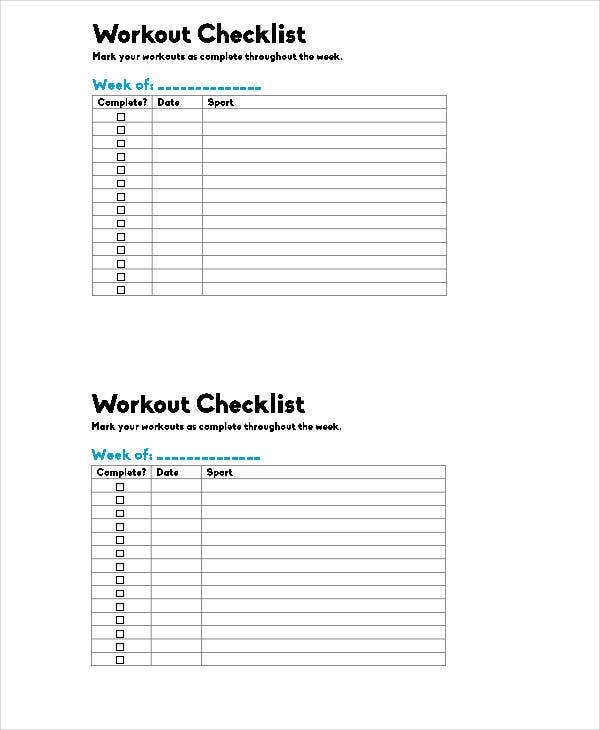 Download any of these checklist templates to start working on your exercise routine. You’ll never forget what to do in your routine and you’ll never miss a body part the next time you work out. 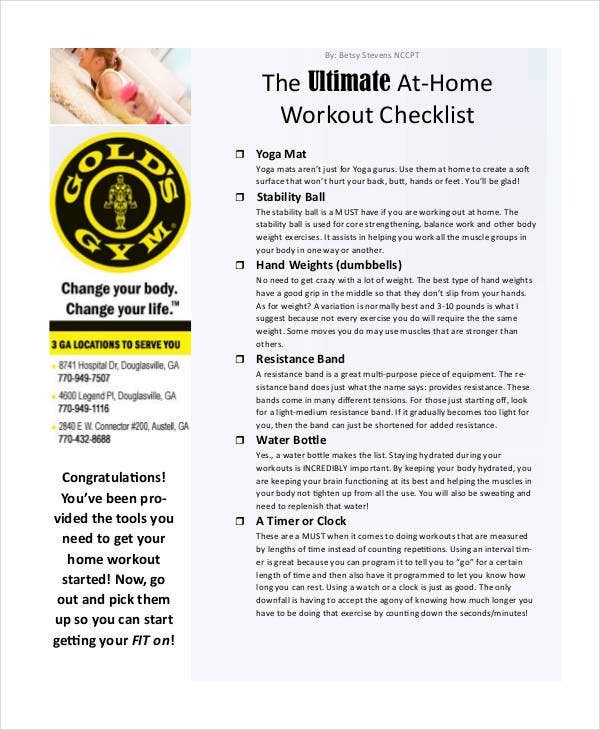 Our checklist templates can be downloaded easily and for free, so you won’t have to spend a single cent on your workout guides anymore. These templates can be downloaded in either high-resolution PDF or fully editable Microsoft Word formats. 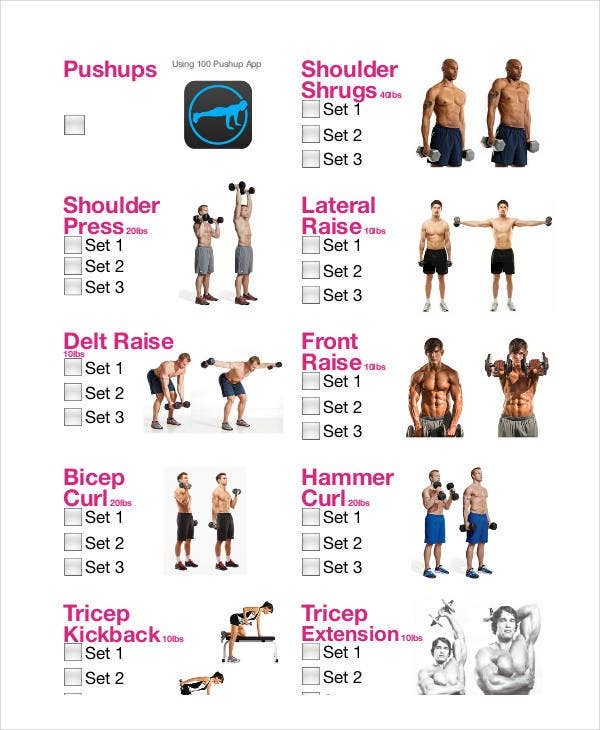 You may easily customize these templates depending on your preferred workout routine with the use of MS Word or Apache Open Office. 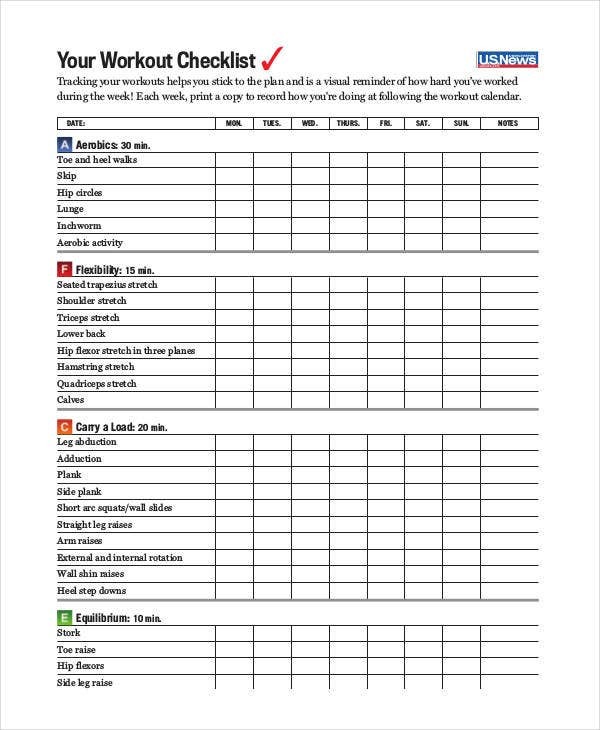 If you are looking for a more customizable checklist templates that you can use for various purposes, check out our collection of Blank Checklist Templates. But if you couldn’t find what you were looking for on this page, then check out the links to other related contents found on our website.